Although cats are excellent self-groomers, their ears could use a little help sometimes. Here, a Waterloo veterinarian advises you on keeping kitty’s ears clean and healthy. Every couple of days, sit your cat down for a basic check of the outer ear. The outer flap of the ear should have a layer of hair, and the inner surface should be a light pink. If you notice bald spots on the ear, redness, swelling, or discharge running out of the ears, contact your veterinarian. To check the inner ear, gently fold back your cat’s ear flap and look into the ear canal. 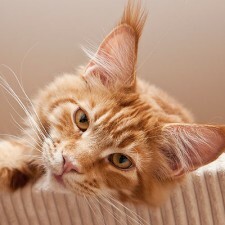 If your cat’s ears are healthy, they should be a light pink, with minimal earwax and no obvious signs of inflammation. If you smell an unusual odor or see a lot of earwax, you’ll want to have your cat examined by a vet. If you want to give your cat’s ears a quick clean, you’ll need a liquid ear cleaner and a cotton ball or square of gauze. Ask your vet about a safe ear cleaner for felines. Put a few drops of the cleaner onto your cotton ball or gauze. Fold the ear back gently, and wipe away any earwax or dirt that’s visible. Don’t rub it, but try to pull it away from the ear. Don’t attempt to clean the inside of the ear canal, as you could do more harm than good. If at any time you notice your cat pawing, scratching, or rubbing the ears, tilting or shaking the head, or exhibiting a loss of coordination or balance, something could be amiss. In addition, unpleasant odors, discharge, bleeding, inflammation, swelling, and obvious signs of hearing loss should be signs for veterinary examination. Set up an appointment with your Waterloo veterinarian’s office to have your pet checked out.